Pre-orders of the 7” Nexus 7 tablet only began shipping earlier this week, but the device appears to have already sold itself out. While previous orders placed from the Google Play store listed a 1-2 week shipping date, the tablet’s listing has now changed to reflect a 3-4 week delay for new orders. The delayed shipping date only seems to apply to the 16GB models for the time being, with the 8GB versions still showing the older ship date. Nonetheless, shortages have hit various other retailers, as GameStop is also showing a “backordered” availability. Unfortunately, it’s tough to get a good read on the reason behind the delays, with insufficient supplies and unexpected demand likely playing a role. The Nexus 7 tablet was introduced by Google last month, and marks the first Android tablet that’s directly affiliated with the company. 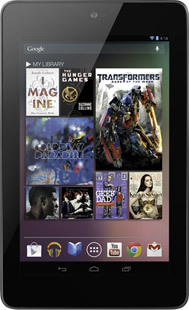 The Jelly Bean-powered tablet features a Tegra 3 processor, a 1280x800 pixel resolution and is available in 8GB and 16GB flavors for $199 and $249, respectively. Orders can currently be placed at Google Play or other retailers, although they might take a while to reach after the latest developments.